Italy is a beautiful, diverse country where every camper will feel right at home. Europe’s boot guides you from the rugged mountains of the north of Italy, via the robust coast on the Adriatic and Mediterranean Sea, to the heavenly beaches of the south. In la bella Italia the rich influences of the Romans and the artistic architecture of the renaissance come back to life. Bargain camping in the midst of this Italian history is a unique experience. On the rocky coast of Liguria you will find the Cinque Terre; five idyllic Italian villages on the Mediterranean Sea. The Cinque Terre are connected to each other via a footpath, the Via dell’Amore, and a railway track. Since 1997 these characteristic villages have been on the Unesco list of World Heritage Sites. The picturesque, brightly coloured little houses of these villages look beautiful against the clear blue water of the ocean and are certainly worth a visit. A unique experience for every walking enthusiast is climbing the Etna volcano. The Etna, situated on the island of Sicily, is the highest active volcano in Europe. Hiking through the volcanic landscape is awe-inspiring because you can see, among other things, the lava streams of previous eruptions. Do take into account that the temperature can dip considerably during the climb! Waking up amongst the rolling hills of the Piemont with an Italian cappuccino or just outside the vibrant, historic capital city of Rome; Italy has it all. 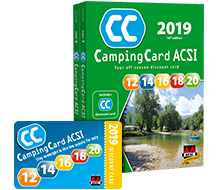 You will find small, intimate campsites on picturesque streams, but also large, richly equipped campsites on the Italian Riviera where you can camp at bargain rates during low season with CampingCard ACSI. If you say Italy, you will be thinking pizza. In 1889 the most famous pizza chef Raffaele Esposito from Napels was invited by the reigning Italian king Umberto I and his wife Margaretha to prepare a meal for them. The pizza maker created a pizza with tomato sauce, mozzarella and basil; the colours of the Italian flag. The queen loved this pizza, which is why it became known as “pizza Margherita”. Various films have been recorded in Italy. The sunny Tuscan landscape in particular, with its elegant grapevines and olive trees and characteristic villages, is a region that has inspired many a film director. Hannibal, for instance, was recorded at the Palazzo Vecchio in Florence and the cornfields just under Siena set the scene for Gladiator. Quite early in spring the Italian temperatures are pleasant, and in the autumn the summer temperatures, especially in the south of the country, linger for a long time. This makes Italy the perfect country for bargain camping in low season. In the north, the climate in low season is a little cooler. In the Alps the temperatures can fall to below freezing. 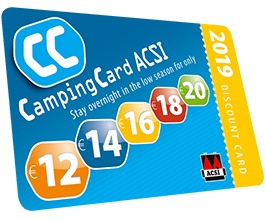 Ideal for winter camping and winter sports enthusiasts!